EXACTLY two years ago, Sen. John W. Warner, Virginia Republican and chairman of the Senate Armed Services Committee, joined the debate on whether to posthumously promote Army Maj. Gen. Walter Short and Navy Rear Adm. Husband Kimmel, both commanders of Pearl Harbor at the time of the Japanese attack. A series of official inquiries between 1941 to 1946 blamed both officers for lack of readiness, and though neither was ever officially charged with wrongdoing, both were relieved of their commands and ultimately retired at the lower ranks of major general and rear admiral. The question now is whether government and military leaders were too quick to render judgment. Were the two officers made scapegoats? Were there failures at higher levels of the chain of command in Washington? Mr. Warner told colleagues: "There's no new evidence. . . . Why should we now at this late date in history make a different finding?" Well, contemporary researchers who accepted Mr. Warner's challenge now answer his question. 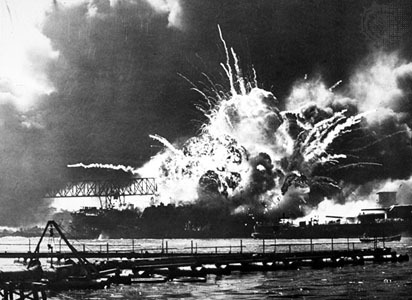 Not only has new evidence surrounding the attack on Pearl Harbor been uncovered, but historian and author Daryl S. Borgquist, a Justice Department official in Washington, believes the U.S. Navy and others are keeping crucial documents "under wraps." Inside the Beltway has learned that, in a lengthy paper being presented today at a World War II conference at New York's Siena College, Mr. Borgquist will offer new findings about Pearl Harbor. He'll say the verdict on Pearl Harbor was reached too soon (upon conclusion of the 1940s investigations), well before crucial documents were declassified and other materials uncovered. Of note, Mr. Borgquist draws attention to a "major historical error" based on the typed text of the first draft of President Franklin D. Roosevelt's "Day of Infamy" speech. Mr. Borgquist says the text was drafted by a State Department team led by former Assistant Secretary of State Adolph Berle between 8:30 p.m. and 12:30 a.m. -- after the first 13 parts of the 14-part Japanese reply to the American ultimatum had been intercepted, decoded, and delivered on Saturday night, Dec. 6, 1941. The attack came on Dec. 7. "Shortly before the attack in 1941, President Roosevelt called him to the White House for a meeting concerning a top-secret matter. At this meeting, the president advised my father that his intelligence staff had informed him of a pending attack on Pearl Harbor, by the Japanese. "He anticipated many casualties and much loss; he instructed my father to send workers and supplies to a holding area. When he protested to the president, President Roosevelt told him that the American people would never agree to enter the war in Europe unless they were attack[ed] within their own borders. . . .
"He followed the orders of his president and spent many years contemplating this action, which he considered ethically and morally wrong." We'll wait and see if the Bush White House talks to Mr. Borgquist and fellow Pearl Harbor presenters at today's conference before making the decision on whether to elevate Gen. Short and Adm. Kimmel, as their families have requested and Congress proposed in the fiscal year 2001 defense authorization bill.